The very life and mission of the Church depend on the sacraments of the New Covenant, starting with Baptism. Sacraments are visible signs of God's invisible grace, of the activity of the Lord Jesus in saving and sanctifying men and women. their power comes from His presence. Penance (a.k.a. Confession and Reconciliation), Holy Matrimony, Holy Orders, and the Anointing of the Sick. Infants should be brought to church to be baptized as soon after birth as is safe and reasonably convenient. Baptism is the sacrament of rebirth as a child of God, of unity with Jesus in His Death and Resurrection, of cleansing from original and personal sins, and of welcome into the community of the Church. Call the parish office for information about baptismal preparation and scheduling. Adults who are not baptized and wish to become Catholic (or at least inquire about the Catholic Faith) are invited to enroll in RCIA (see Ministries). If the intended sponsor is not a Santo Christo parishioner, he or she must obtain a “sponsor certificate” from his or her parish priest. Qualified sponsors who cannot be present at the baptism may appoint another person to serve as proxy; the proxy should meet the same requirements of any sponsor. 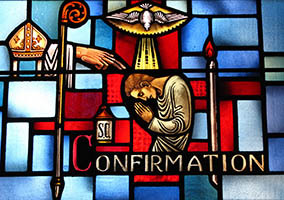 Confirmation is the sacrament by which those born again in Baptism now receive the seal of the Holy Spirit, the Gift of the Father and the Son. Preparation for the Sacrament of Confirmation in the Diocese of Fall River is a two-year program for 8th and 9th graders. At the end of 9th grade, candidates receive Confirmation after attending Mass with First Communion "prayer partners" every other week, six hours of community service, and a retreat. Unconfirmed adults should enroll in RCIA (see Ministries). During this retreat Confirmation candidates will learn spiritual lessons about family, Mass, and the formal faith formation process. We also invite adults to help prepare our candidates to meet the spiritual challenges they will face in our modern world. with only the physical properties of bread and wine remaining. Catholics are encouraged to receive the Real Presence of our Lord in the Eucharist, or Holy Communion, devoutly and often. and normally should have fasted for one hour. One who is conscious of grave sin is not to receive Communion without prior sacramental confession. after a two-year program of preparation which includes sacramental confession. If you are engaged or considering marriage, contact us at least eight (8) months before the intended wedding date. 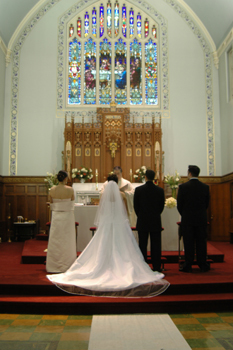 We cannot schedule your wedding prior to your initial meeting with the parish priest. Couples preparing for marriage must attend a Marriage Preparation or "Pre-Cana" conference. You may register for this online after your initial meeting with the parish priest; to register, click HERE. In consultation with the priest (or deacon) who will be officiating at your wedding, you may choose Scripture readings from the selection of readings approved for the Rite of Marriage (click HERE). Rehearsals are normally held the evening before the wedding. Bring to the rehearsal (unless you have already provided these at an earlier time): your Massachusetts marriage license; the church fee ($125, payable to "Santo Christo Parish"); and the musician's fee ($125, payable to "Cash"). The Anointing of the Sick is the sacrament for the seriously ill, infirm and aged. lighten their sufferings, forgive their sins, and bring them to eternal salvation. 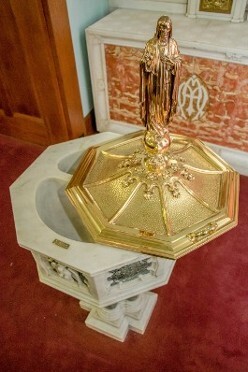 This sacrament is best received as soon as the danger of death begins, from sickness or old age. To request the sacrament for yourself or another Catholic, call the parish office. recognizes herself as bound by the choice made by Christ Himself. Only validly ordained bishops, as successors of the Apostles, can confer Holy Orders. especially by offering the divine Sacrifice of the Mass, and to be shepherds of the faithful. Priests in the exercise of their sacred ministry speak and act not on their own authority but on that of Christ and His Church. by the ministry of the Word, of divine worship, of pastoral care and of charity. speak to your parish priest. For the website of our diocesan Vocations Office, click HERE.